Where to Buy Snowboard Jackets Online? When you are going out snowboarding, your first initial wish is to keep warm, and how else can you keep warm other than with cozy, waterproof, durable and the all-round best snowboard jackets? The answer is, you can’t! Men and Womens Snowboard jackets have become increasingly more modern and appealing over the years and they no longer have to make you look overweight like they used to. Nowadays, you can find a jacket that will suit you and keep your slim silhouette in tact. The main things to consider in a men or womens snowboard jacket are: what fabric, soft shell, is it waterproof, what is the breathability like, and is it suitable for everyday wear? Whether you are looking for a heavy-duty winter jacket or a light-weight, slim jacket, there are plenty of offers out on the market that will suit just about anyone’s tastes. To help you decide which jacket is right for you, we compiled a review of 19 products that are, in our opinion, leading industry standards. We also have a small information section where you can learn about the specifics of the product and what you should expect from it! You can also use these jackets when operating a snow scooter. Before you go further, you may not know how important they are, but make sure you know the correct flex rating for your snowboard bindings – you could be cheating your way out of a successful slide down the slopes! Need a ‘jacket’ for your snowboard? Shop for the top snowboard bag here. Marmot has had their snowboard jacket out on the market for over three years now, and customers have proven to be as happy with it three years ago as they are now! This product in particular is covered overall with helpful, small storage pockets where you can easily hide away your pass, wallet, change or any other accessories such as snowboarding gloves – see the full review. The pockets are located in very intuitive areas and are fully function: you won’t be bending left and right trying to put your hotel keys away, that’s for sure! The hood is extremely well made and its durability can withstand a blizzard thanks to how tightly it sits around your face while still keeping its solid shape. Add a face balaclava for extra warmth. The collar here is also very well positioned and stands firm and keeps its form no matter how windy it is; it fully surrounds your neck from all sides even when unzipped. Many people report that they have tested this jacket in temperatures that go well below -25 degrees and have not felt any noticeable cold in the upper part of their body. The puffy exterior is designed in a way to keep you slim and warm despite the puffy exterior. If you are looking for a stylish coat that will keep your silhouette in tact, Marmot’s snowboard shadow jacket. Why We Liked It – If you like long snowboard rides in the deep, freezing cold this jacket is the perfect companion. Marmot will keep you warm and safe and will keep your temperature regulated in the top temperatures so that you won’t experience any discomfort. Remember to keep your feet warm with a great pair of ski socks! No matter where you will be snowboarding, you can rest assured that Marmot’s jacket will keep you safe – avalanche safety is key. If you are tired of looking at all those big snowboard jackets and are wondering if there are any regular, thin jackets on the market, then Arc’Teryx’s jacket will be a good pick for you. Right from the get-go it’s easy to see how slim and non-intrusive the design is and it will accompany any pair of ski pants with grace and purpose. The jacket is dyed in a light, reddish gray color with red zipper accessories. There are five pockets located all around the jacket; there is one zipped hand pocket, two chest pockets and one sleeve pocket where you can store your loose change or snacks. The hood will give you full protection from any and all kinds of winds, so no matter where you are on the slopes you can be sure that Arc’Teryx will keep you safe and protected. Having a solid hood is vital, since it’s the one element that will be protecting your ears and face from harsh hail, snow or wind. Seasoned snowboarders will definitely know just how important it is to keep your head and face covered during harsh weather! The hood is also designed to rotate with your head, which means you won’t encounter any resistance when you try to look back or to the sides! + Breathable material – high breathability ratings! Why We Liked It – Finding a good snowboard jacket that will make you look good at the same time may seem like searching for a needle in a haystack, but Arc’teryx knows how important it is to provide customers with options, and the Snow Rush Jacket is the perfect example of a jacket that will help you look thin and attractive on the slopes! Wantdo is another great company that puts customers first, and we can see that thanks to all of the customizable options that they provide upon the purchase of these fleece jackets. When purchasing this jacket, you will get to choose between six colors: black, blue, red, green, khaki and brown. This is a great variety of choices for anyone that wants to stick out on the slopes and wants to be visible to the rest of their relatives/group/friends when everyone else is in ski clothing in gray or black! The warm fabric is water repellent which will help keep you dry even during the heavy-snowfall days and the inside fleece liner will help keep you cozy and warm no matter how cold it gets. The jacket is also very effective in fighting off heavy rainfall, which is ideal for anyone that is going to snowboard in areas that have unpredictable weather. Just as it is waterproof, the jacket is windproof and will protect you from all those dangerous winds that can make you feel colder than a bit of snow ever could! To help keep you protected, Wantdo has provided their customers with adjustable cuffs, a stretchable ski gloves with thumbholes, an internal draw cord hem, and an adjustable hood. Why We Liked It – It can be hard to find a women or mens snowboarding jacket that has various color options available to choose from, and Wantdo knows that. That’s why the provided their customers with a variety of different colors to choose from no matter what your tastes are. The waterproof and breathability wind repellent shell will keep you safe no matter where you are on the slopes! Columbia is known for providing their customers with wonderful, slim, appealing and warm jackets that have more than 10 colors to choose from upon purchase! The 100% polyester material will keep you snug and warm inside your jacket both on and off the slopes. The detachable storm hood is a great addition for those snowboarders that find it to be a nuisance or for those people that like to wash it separately from the jacket itself. The zippered pockets that are located on the sides of the jacket are heavy-duty pockets and are the perfect place to put your phone or keys if needed. They can be very effectively sealed and you can be sure nothing will fall out thanks to the sturdy zippers! The flap pockets on the chest are also great places to store things like your ski pass or tickets. Columbia knows that having your necessities at hand when you are out on the slopes is necessary, since backpacks usually only weigh you down and can cause accidents if you are snowboarding in a wooded area and get one of the straps hinged on the branches. If you are looking for great price combined with great quality, this is the best jacket to go for. Why We Liked It – Columbia has shown us that you can get a very effective snowboard jacket at a good price without sacrificing the quality of the product itself. The insulation here is great and the overall performance and usability of the coat is fantastic. The design isn’t crowded and every feature has its purpose. It’s easy to see why Arc’Teryx is one of the top brands when it comes to snowboard and mens ski jackets. Arc’Teryx has mastered not only the craftsmanship of their products but the features and customizability of the jackets too. This jacket is available in up to 13 colors and the variety of the colors is wonderful- you will be able to be fully unique and independent on the slopes. This jacket has been popular on the market since the 2000s and is still going strong! It’s surrounded by 5-star review from faithful customers that have been using this jacket for over two decades. This jacket is the full-blown definition of the phrase “tried and tested”. Why We Liked It – Arc’Teryx has supplied the market with a great variety of mens snowboard jackets, and the GoreTex snowboard jacket is exceptionally good in keeping you shielded from the cold when you are snowboarding down the powdery hills and want to rest assured that you are kept warm and cozy. Arc’Teryx has designed a jacket that will keep you shielded from the cold even during -30 temperatures! If you are looking for a jacket that will help you store all of your necessities and accessories, then you don’t have to look any further! Salomon has a goggle mesh pocket where you can store your goggles when you are not using them and there are also two zipper chest pockets where you can put your pass, snacks and any other necessary things. The jacket itself is a very lively turquoise color with border-florescent rims; this is a wonderful design if you are into more fashionable and good-looking jackets that will protect you and make you look good at the same time. The insulated snowboard jacket also has an advanced mechanism that will help keep your skin and body insulated no matter how cold the outside weather gets. The hood is easily detachable, which is a great feature if you want to dry it, wash it or simply shake it off from all of the excess snow that you gathered during your snowboarding session. The waterproof jacket is also windproof and can handle even 20-30mph winds. If you are going to be snowboarding in rough terrain, this jacket is the perfect companion thanks to all of its protective capabilities. Despite all of the synthetic insulation base layers, the jacket still manages to be light-weight, which is a great plus for anyone that is traveling a lot or needs to carry as little weight as possible when competing. Why We Liked It – Salomon’s jacket is a wonderful product that will keep you protected wherever you are on the slopes. The detachable hood and windproof qualities make this jacket a perfect companion for the harsh winter days when you need to be kept exceptionally warm. The synthetic insulation base layers will help you stay cozy and snug no matter how long your snowboard sessions are! Descente has been known to have some of the most fashionable jackets on the market- they are the ideal product if you are looking for something that will slim you down and not puff you up. The stylish, simple design embellished with a simple, line pattern has this jacket take on a very distinct, winter sports look that many snowboarders are after. The main coat color comes in two variations: white with black diamond accessories and black with neon green accessories. The coat is very heavily insulated and fully waterproof thanks to the snowboard outerwear top protective shell layer that won’t let any moisture leak through to the inside. Descent’s goal here was to design a jacket that will not feel bulky and will not restrict movement and by looking at all the 5-star reviews, we can safely say they succeeded. The insulation mechanism here is designed to reflect body heat right back at you, this way you don’t have to keep generating new amounts of energy to keep yourself insulated and can use the rest of it for snowboarding! The removable and adjustable hood is a great option for those calm days when you don’t have much wind and don’t want a hood crowded around your neck. Why We Liked It – Descente has provided us with a top-quality snowboard jacket that is loved by many all around the world. The design looks great and the insulation mechanism here is one of the best. You will not get cold wearing this jacket, nor will your movements be restrained in any way, shape or form, and that is what snowboarders like most! The North Face is undoubtedly the most popular brand that manufactures and sells quality outdoor products, and this jacket is no exception. It’s made of 95% polyester, which makes it perfectly waterproof and windproof. The inside liner is made of 100% nylon and polyester which means that you will be kept insulated and warm no matter where you end up snowboarding, whether it’s black trails or recreational off-piste rides, North Face will shield you from all of the harms that cold weather can drag along with it. The PrimaLoft synthetic insulation will keep you warm even if it’s damp and wet, which means you won’t have to worry about getting cold even when you are sweaty! Many snowboarders catch a cold between the time they get off the slopes and have to make their way back to their resorts, that is the time when you don’t have to use as much physical power like you do when controlling your board and body starts to cool down, which results in cold sweat unless you are moving at a very fast pace. North Face knows how to keep their customers satisfied, and that’s through keeping the warm, insulated and warm even when they are off the slopes. Why We Liked It – North Face has been on the market for a very long time, and they keep improving their products based on the customers’ feedback. That is one of the things that set North Face jacket womens apart from the others, all the features here are useful and not bothersome, since you will quickly find that all of them have their purpose! Check out the North Face purist as an alternative. Burton is known for their stylish snowboard jacket mens design and above all, their trademark fleece collar. With over 15 color choices available to choose from, you can rest assured that you most definitely find a jacket that will suit you and the rest of your snowboarding gear, and that’s an important aspect for many people. The chest pocket will provide you with a place to keep your entire belongings safe and secure and it also allows you to access the interior dump pocket. If you are looking for a jacket that has quick accessibility to all of the features located on the front and sides of the jacket, then the Swash Snowboard Coat is the ideal jacket for you. Not many other jackets have such good efficiency when it comes to the placement of their features. When purchasing this Burton jacket you will also get lifetime warranty, therefore if you run into any trouble on the slopes or if the product you buy ends up being damaged or simply does not live up to your expectations, you can know you’re protected. All of the sleeves and the waist are designed with the seams being sewn in a way to help your joints remain as articulate as possible. Why We Liked It – Burton is one of our favorite choices thanks to all of the options that they provide when it comes to customizing your product, and not only that, but you also get a lifetime warranty when you purchase this jacket. This fantastic addition since any avid snowboarder knows how quickly you can damage your jacket through no fault of your own! Last but not least we have yet another one of Burton’s products, this time the Breach Snowboarding Jacket. This product in particular is the definition of versatility; there are over 21 colors to choose from when purchasing this jacket! No matter how fussy you think you or your relatives are, there is definitely a color within this batch that will suit you, your family and friends. The jacket is fully waterproof with a 2-layer polyester mechanism that blocks any kinds of moisture from getting through from the outside. The insulation is also fantastic; mainly thanks to the mapped THERMOLITE lining that is designed to keep the heat in and the cold out. The fully taped seams will help you achieve maximum mobility and won’t restrain any of your movements no matter how aggressive or sudden they are, and that’s why Burton is so confident with their product. The pockets are easily zipper and there is a pocket for both goggles and other necessities, like snacks, passes and the alike. No matter where you like to snowboard, you can be sure that you will look good with Burton’s snowboard jacket, it’s hard to find such a versatile jacket anywhere else on the market! Why We Liked It – Burton’s Breach Snowboarding Jacket is one of our favorite products thanks to the very articulate seams that they sew and the insulated liner that keeps the rider warm even during the coldest of days. No matter how long a time you spend on the slopes, you can be sure you will be kept well shielded from both the snow and wind thanks to this jacket! Buying a snowboard jacket can be as exciting as it can be frustrating, a jacket is probably the most important piece of gear you can buy since it keeps the main portion of your body and limps warm. Without a good jacket, it’s doubtful that you will be able to snowboard for very long since your body can go into shock quickly if it’s not properly insulated in below freezing temperatures. Even during mildly cold days, when you’re exposed outside without a good layer of insulating men or womens clothing, it can quickly lead to a tragedy. Since we know how important it is to have a good snowboard coat, we decided to give you a quick listing of the specific features you may need to pay attention when buying a new snowboard jacket! + Insulated jacket- this type of jacket is layered with various insulation fabrics that are located underneath a protective waterproof material to make sure the layers are protected and effective during every outing. Some types of jackets, like the “down” jacket, have the insulation layers located in the outer shell. This increases the warmth but also makes the jackets rather heavy. + Shell jacket- a shell jacket doesn’t have any insulation at all, which means it’s way lighter than insulated jackets and may actually suit snowboarders more, since they already warm up quickly during their sessions and not having extra bulk may help them perform better. This jacket is definitely less warm and is better for the spring seasons. You can always put extra layers beneath the jacket if you feel like it, too! From polyester to nylon, there are plenty of fabrics used when making an effective snowboard jacket. Some products have combined the fabrics and have both polyester and nylon etc. Looking at the fabrics the jacket is made of will help you determine which features the jacket has and if they are or will be useful to you. This of course means how waterproof your jacket is and how much water it can repel before it gives wet. Each company does tests with their products to see just how much water the jackets can shield themselves from before the drops start to come through on the other side. Waterproofing is usually measure in millimeters and anything between 5,000 to 30,000mm can be considered a normal waterproofed coat. The higher the millimeters go, the more waterproof and repellent your jacket is. Some products are not given a waterproof rating at all, since they are considered by default to be 100% waterproof. The breathability of the product means how well you can keep yourself ventilated inside the jacket without getting too sweaty. In short, how much of your inside warmth can escape to the outside. This is measured in GM’s, and just like with the waterproofing, the higher the numbers go the more breathable the product. Anything between 5,000GM to 20,000GM can be considered breathable and reliable out on the slopes. The idea here is to allow some of the sweat moisture out so that you won’t get clammy inside your jacket. Vents are usually small slits located all around the jacket and they are like zippers, but on the inside they have a thin liner of foil. You can zip and unzip them at will and that’s what makes them so easy to use, you can open them even during mid-slope! If you don’t want to feel uncomfortable and clammy inside your womens ski jacket or mens ski jacket, you don’t only need a breathable jacket, but also a few vents! Many jackets provide vents around the armpit area to help quickly eliminate the moisture without you having to expose all of your insulated body to the cold elements by completely unzipping. This lets you gradually regulate your temperature levels and decreases the chances of catching a cold since you are not exposing your body to any sudden temperature changes. All of this is important when you are XC skiing, or partaking in other winter sports. This term can be confusing for many beginner snowboarders since it’s hard to figure out the meaning from the title! Powder skirts are simple, elastic bands that help close up the gap between your men and womens snowboard pants and jacket. These bands help eliminate any droughts by keeping all of the snowboard clothing tightly packed together, not letting through any cold air from the outside. The most common powder skirts will allow you to zip or clip them to the top of your snowboard pants so that you can have full-shielded protection. Most snowboarders need some kind of music when they free-ride off piste since it enhances the moment, but it’s hard to drag along phones and IPods in such low temperatures, and the headphones can get very easily tangled when you are trying to navigate through the slopes. That’s why many snowboard jackets now include special IPod pockets where your device can be kept warm and protected. When placing your IPod in such pockets you can be sure it won’t fall out and if the jacket has a headphone loop, you won’t have to worry about getting tangled in the cables! Every seasoned rider will know how important it is to have pockets located both on the inside and outside of their snowboard jacket. These pockets can provide a safe asylum for things like passes, snacks, tickets, goggles etc. Many jackets nowadays have inside or outside pockets that are made to hold goggles when you don’t need them, which is a great convenience, since you can never expect when the weather will clear up. If you are out in extreme cold and wet conditions every day, your gear can get ruined very quickly! That’s why it’s important to decide how often and what conditions you will be exposing your gear to. Waterproof zips and taped seams are the first go-to feature that professional snowboarders look for- this ensures that they are kept warm and safe from the wet snow and rainfalls when they are boarding around the slopes. This keeps their inner layers dry and snug without succumbing the rider to the ruthless elements that are lurking outside the jacket. Professional jackets have fully-taped seams to prevent any sort of moisture pushing its way through, and if you are going to spend a lot of time snowboarding in hard, straining conditions then it’s better to be as prepared as you can! This depends on what kind of jacket you end up getting! The jackets available can be divided into two categories: shell and insulated outwear. Both are different and suit the needs of two different types of people. If you are more of an aggressive snowboarder, it might be better to get a shell jacket since they don’t have any insulation of their own. This will make you rely on your own body temperature and own clothes layers beneath if you still want to keep warm when not snowboarding. With insulated snowboard jackets, all you have to do is slide them on! The insulation layers will keep you warm and snug when you snowboard during extremely cold temperatures and the vents on the sides will help regulate the amount of fresh air you let in and out. Every snowboarder prefers something different, and it’s the same with snowboard jackets. If you want to be kept warm by only the jacket itself, then you should get an insulated jacket that can keep you warm thanks to all of the insulation layers that it has on the inside. If you prefer to layer up yourself with your own clothes and then put on a shell jacket that will just give you a waterproof and breathable layer, then a shell jacket is the ideal choice for you! This also depends on what kind of jacket you end up getting! Most snowboard jackets are waterproof to help prevent the rider having to wear wet layers. Snowfall can be heavy in the mountains and each company knows that if they want their jacket to sell well, then they need to provide their customers with this feature! Although we can say that the vast majority of snowboard jackets are waterproof, we cannot with certainty say that every single one is endowed with this function. The best things you can do are checking the bullet points and product description of the jacket and see if you can find the waterproof function there. Usually the waterproofing of the jacket is measure in millimeters, and the higher the number of the millimeters (5,000-30,000mm) the more waterproof the jacket. Looking for this kind of data and help you quickly decide which jackets will suit the weather you will be snowboarding in, wherever you will end up spending your practice and holiday sessions! 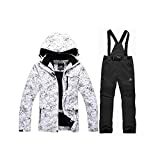 The best websites for buying snowboard jackets and snowboard gear overall are Amazon and Evo! Both of these websites have plenty of reviews, opinions, and descriptions etc. that make choosing easier than ever before! Our Top Pick product has to be Marmot’s Shadow jacket, simply because it’s one of the best jackets for those cold winter days when there is heavy snow fall and several meters of snow laying underneath your board. Every seasoned snowboarder knows how easy it is to get this snow directed at your upper body if you are doing tricks, and even just through intense snowfall, but Marmot gives a great solution to all of its customers, and that’s this fully functional snowboard jacket. Whether you are on the slopes or heading back to the resort, you can zip and unzip your hood to shake off all the excess snow particles that may be resting on the top so that you don’t drag them into your hotel room! There are also pit-zips located near the armpits to make sure that even when you feel you are getting sweaty, you can quickly unzip both and ventilate and get rid of the excess warmth that is bothering you. Our Top Choice is Marmot’s Shadow jacket because of all of the features that it includes, like the zip-off hood, the reinforced shoulder and sleeves areas of the jacket, the waterproof qualities and much more! Our Premium Choice has to be Arc’Teryx’s gray caden snowboard jacket. It’s the perfect product for anyone that is looking for a well-designed, breathable jacket that will keep you warm and ventilated all throughout your snowboarding adventures on the slopes. Every snowboarder knows how important it is to keep you ventilated when you are engaging in intense training or are trying to learn new tricks. The storm hood will give you full protection from winds and snow or rainfall and it fits perfectly over ski helmets, which is a feature most jackets are not equipped with. Having a hood that can cover your helmet is great if you are trying to be safe and dry at the same time. If you have had trouble in the past with the hood of your jacket not letting you rotate your head, you can be glad to know that Arc’Teryx has designed a fully operation hood that will allow you rotate your head without straining in every direction. Our Premium is Arc’teryx’s product because they have designed a jacket that can be used and appreciated by many snowboard enthusiasts. It’s a great jacket that is specifically crafted to help you survive those cold, power snow days. Our Great Value product has to be Wantdo’s snowboard jacket. Wantdo knows how hard it can be for one person to be distinguished among the sea of many on the slopes, and that’s why they offer a variety of 6 colors to choose from when you are purchasing your jacket. No matter what color the rest of your gear is you will be able to choose something that fits the rest of your snowboarding accessories, which is an important aspect for many people. The soft shell jackets themselves are fully waterproof and lined with very soft fleece that will keep the inside of your coat warm and snug no matter how cold it may be outside. If you like snowboarding during the coldest time of the season when the temperature goes well into the minus degrees, then Wantdo’s jacket will be the perfect fit for you. The adjustable cuffs and the internal draw cord are perfect for tightening your jacket to keep you shielded from the harsh reality of the slopes! Our Great Value product of choice has to be Wantdo’s jacket because of the variety of colors they provide and the adjustable cords and hood that let you keep you warm and protected even during the coldest of days. Trying to find a suitable winter jacket can be hard and oftentimes demotivating, since there are so many fantastic options out there to choose from that a customer can get overwhelmed very quickly. Regardless, we hope that we managed to help you make a good choice or at the very least that we helped lead you in the right direction with our buyer gear guide and review sections. We also hope that you have found or will find a snowboard jacket that you are fully satisfied with! Check out our Ski resort guide!